Bwin poker for Apple iOS and Google Android devices now supports Sit and Go tournaments, Fast-Fold poker and Texas Hold'em cash games. Play for Fun tables are also available from their iPhone and iPad applications. Play real money Texas Hold'em ring games on the iPad. Also works on Samsung Galaxy, HTC, Motorola, LG etc. Sit & Go tournaments now also supported on mobile. Play Fast Fold high speed poker on both iOS & Android. 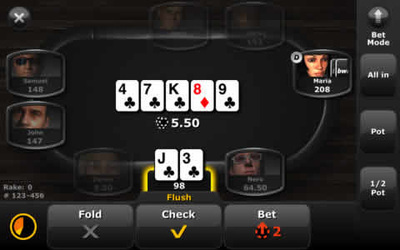 Use swipe gestures to indicate bet, raise and fold. One of busiest rooms following merger with PartyPoker. Bwin have been one of the largest operators in the poker industry for some time now. Whilst the company are probably better known for their relationship with the sports betting world, they have managed to build up a large and loyal fan base via their poker section. The company have worked hard to establish themselves as much more than just a sportsbook, with the inclusion of casino, poker and other game variations being a massive part of that. One area where the company have worked hard is that of their mobile sector. Their latest venture comes from that of their iPad mobile poker app which is readily available to download directly from the app store. In fact, the company were one of the first legitimate companies to provide an app directly from the app store even when regulations for gambling apps were prohibited by Apple. As these regulations are much more gambling friendly, Bwin have managed to gain a large head start over a lot of their rivals within the mobile industry. For those of you already familiar with the company, then you will know how much their sites and software has developed over the years. This is what makes us so excited to see how well their iPad poker app stands up against that of their rivals. The first thing we noticed about the Bwin iPad app is simply how good the home screen looks. The added room on the iPad screen often makes for better viewing than compared to the smartphone equivalent, but it’s just so simple to navigate and find your way around with the app. The homepage includes a number of options which are Real Money poker tables, Fast Forward, Play Money and Preview. Also on the home screen are your account, settings, help and log out buttons; all of which we will discuss later in this article. The main section is going to be the Real Money section, so this is where we will start. Once into the landing page for this you will be able to choose between which game type you want to play, number players at the table, stake and also check your balance. So the game types tab is a little misleading and at first we thought it would be to select between Texas Holdem, Omaha and those sorts of variations. But in fact we quickly realised that only Texas Holdem is available on the app and this section just allows you to choose between fixed limit, no limit and pot limit variations of the game. However you can choose between 6 seater, 9 seater and 10 seater tables along with heads up games which is actually something that’s very rare on most poker apps. Game stakes is another feature which really stands out on the app. Most poker apps that we have tested so far are pretty limited in the levels in which you are able to play. Most include just a handful of micro limits, but Bwin actually include stakes ranging from 1c/2c all the way up to $25/$50 which is easily one of the biggest ranges we have come across. The Fast Forward tables are basically Bwin’s attempt at offering speed poker to their players. If you are unaware what speed poker is then it’s basically a form where you play within a pool of players and as soon as you are done with your hand you are moved to another table instantly to play another hand. Here you simply select your table size (only heads up and six seater tables are available) and your stake before being flung straight into the action. Sit & Go tournaments are now available on iPhone, iPad, Motorola DROID, Samsung Galaxy S5, Sony Xperia and every other type of Android device. Finally the Preview tab is a section we recommend all players who are using the app for the first time visit. It’s pretty self-explanatory; simply a section which gives you an overview of how exactly the tables work on the app. Whilst you don’t exactly need a degree to function it, getting to know how everything works straight away is definitely going to be beneficial. The tables are probably the highlight of the whole app. They look absolutely stunning in all honesty and are by far and away one of the best we have ever seen. It’s a much darker look than a lot of poker rooms but it just looks really slick and the inclusion of avatars – which admittedly isn’t something we are always keen on – really adds to the table. Even the sounds aren’t too annoying, but we did find we switched them off after a while after finding out you could use a vibrate option instead to alert you of when you need to act. The tables include a slider when choosing betting amounts which we have previously heard some grumbles about. But we actually found the slider very simple to use, although the inclusion of manually being able to input your bet amounts would have been good. New users to Bwin can enjoy a 100% deposit bonus worth up to $500. The bonus is redeemable from your first deposit and will be released in 10 equal amounts and when you reach the qualifying terms. To release your bonus you will earn points as you play at any of the real money tables on the app. You will receive 6 points for every one dollar cleared at the tables. The bonus must be cleared within 60 days of your first deposit and any remaining bonus not cleared within that time will become void. 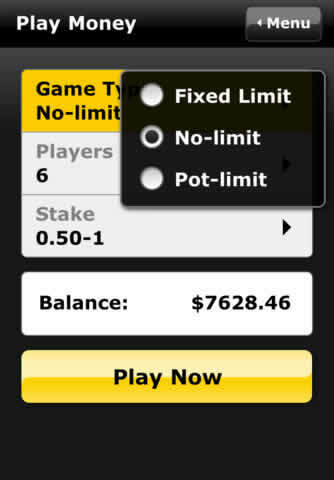 There are also a host of freerolls available for new players to Bwin. The first is a welcome freeroll with a guaranteed prize pool of $1,500. This is basically eligible to anyone who has just registered a new account. The second is two daily shots at getting in the $5,00 Bankroll Booster freeroll which is played every Sunday. In terms of aesthetics there are very few that can compete with Bwin. It’s obviously an area thy have been keen to develop and we can report that they have been very successful in doing so. Another area in which we were impressed by is the sheer volume of levels you can play. Very few apps really go above mid stakes levels but with games hitting up to $25/$50 will mean that a huge range of players will be accommodated for. Downsides to the app come in the form of their being poker variations to choose from. With just Texas Holdem on offer it makes the app a little one dimensional and will put off players who enjoy mixed games. Also the lack of multi tabling features means that it’s just one table available at any one time, which compared to some of its larger competitors falls some way short. 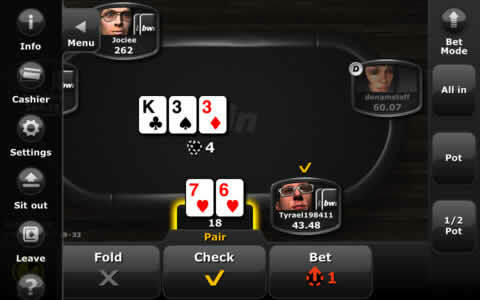 Overall Bwin have managed to produce an excelling poker app. It looks, feels and runs like a real high end product and we would be happy to recommend it to anyone looking to play Texas Holdem ring games or Sit & Go tournaments on their iPad.